Good rainfall over several years grows trophy antlers. Every decade or so the stars, the clouds and that pool of warm water in the Pacific Ocean that produces El Niño align, and it rains antlers. 2016 was one of those years. It was also the year that I took my best buck ever, an East Texas 14-pointer. Without the rains of 2015 and 2016, he would not have grown that rack, nor would I have been able to hunt him successfully. More on that later. Lots of rain alone doesn’t guarantee that the deer where you hunt will be trophies. 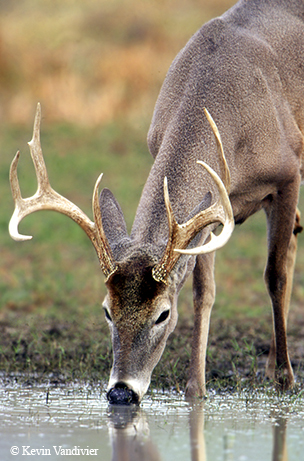 Besides nutrition, antler quality depends on genetics and age. Biologists surmise that while the natural deer population contains all the genetics necessary to grow trophy bucks, it is helpful to cull the herd to remove bucks that don’t achieve the desired growth, leaving those with better genetics to do the breeding. As selective harvest continues, removing older does can also help, since the younger does are more likely to carry the better genes — and they contribute half the genetic makeup of offspring. Given the cyclical nature of rainfall, range managers know that the best results are obtained by controlling deer numbers so that there is plenty of food available even during dry years. This means not only harvesting does but also keeping livestock numbers below the level that damages the habitat. 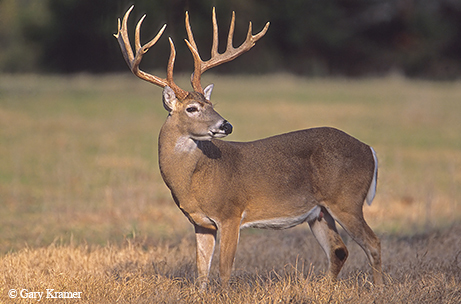 As for age, the 13-inch minimum inside spread rule instituted in many counties has let more bucks survive long enough to express their genetic potential — and live through enough wet years to get the food they need. The timing of rain also matters, as does the type of vegetation it falls on. In a nutshell, rain has to fall on the right kinds of plants during two important times in order for bucks to grow bigger-than-normal antlers. To understand this, you first need to know how bucks grow antlers. Preparation for antler growth begins toward the end of the calendar year, during the time hunters think of as the post-rut. Bucks worn down by the rigors of chasing does and battling other bucks lose weight and become more susceptible to disease and parasites. They need to feed during the very time of year when plant growth is at its lowest. In drought years, when browse and forbs have been depleted, bucks may starve during this critical time. But if it rains in late summer and fall, enough food may be available for them to replenish stores of fat and go into the antler-growing season in good condition. Winter rains kick-start the spring green-up. The first growth of forbs has the highest protein content; a year when the country starts to green up soon after the first of the year stands to be a good one for antler growth. But it doesn’t end there. Bucks drop their antlers in late winter and almost immediately begin the process of growing new ones. All the high-protein deer feed and minerals you put out at the end of summer and start of fall has absolutely nothing to do with antler growth. Deer need high-quality food during the spring and early summer antler-growing season to produce bone. If they’re not getting supplemental feed, they have to depend on plants. And plants depend on rain. Antler growth is so rapid and so demanding that bucks actually have to borrow calcium from other body bones in order to produce antlers. At the same time, they are shedding their winter coat and growing new hair, which is mostly protein. It’s a very stressful time for deer. Good nutrition during this time makes all the difference — but only if it has a foundation laid during the fall and winter to build on. It’s common knowledge that all deer are not created equal, and neither are the plants they eat. 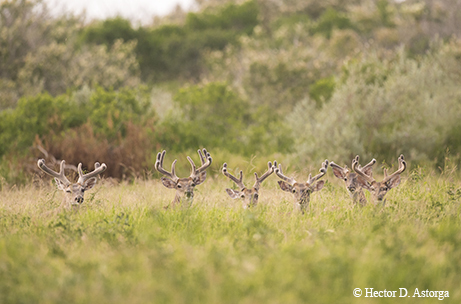 Deer in South Texas generally grow larger and have bigger racks than those elsewhere in the state, and the reason is the kinds of vegetation that grow in different parts of the state. South Texas brush is so varied that even in years with poor rainfall, some kinds of plants will do well enough to support good (though perhaps not great) antler growth. And that brush is ideal deer food. Other regions of the state lack this advantage. But lots of available foods do a buck no good if the food has already been gobbled up before he gets there. Controlling deer and livestock numbers so that adequate food is available during all years, not just wet ones, is a key factor in producing the kinds of antlers that give hunters “buck fever.” That’s why ranches known for producing trophy bucks aggressively harvest does and carefully manage livestock numbers if possible. I theorize that something else connected with rainfall is at work. Some years, when rain falls at the right time, bucks produce antlers that are barely better than average; some years produce great antlers. Deer researchers have shown that a buck that receives good nutrition during its first year of life will have better antlers than deer that did not eat so well that first year (or subsequent years). Does need good groceries to produce and rear fawns and give them that good first year that is so important. After all, when mama’s happy, everybody’s happy. Rainfall in Texas is cyclical. It’s rare to have two, much less three, years of good rains in succession. Consider a buck born in a year when all the conditions were right. He will be fully mature at 4.5 years of age but probably will not grow his best sets of antlers until he is 5.5 to 6.5 years old — if he lives that long. In order to produce the very best antlers that genetics, age and nutrition make possible, he has to be alive at the right age during one of those years when it rains the right amounts at the right times. In short, there isn’t just one year when it rains antlers — there have to be two or more such years separated by four or five years. At least, that’s what I believe. I took my best buck ever in 2016, off my tiny 24-acre place in East Texas. During the El Niño episode of 2015-16, we had a number of 6-inch rains and many lesser ones, so much so that the property grew up in weeds taller than my head. During the 13 years I’ve owned the place I’ve practiced benign neglect, allowing brush, grasses and weeds to reclaim pastures formerly harvested annually for coastal bermuda hay and grazed intensively. The land has responded by producing more and more cover and a greater variety of deer foods, and game camera pictures over the last few years document an increasing number of deer, including bucks with better and better racks. Last year I took advantage of the tall weed growth to lay out a path to my hunting area so that I could approach without being seen or smelled with the wind from the southeast or northwest. My stand is on the edge of a grove of oaks a couple of acres in size that connects to wooded fence lines on three sides, right where the grove pinches in and forms a funnel. My game camera recorded the same three does regularly, at all hours of the day and night, so I’m sure their bedding area is on my place. I never enter the wooded areas so as not to disturb them. Beginning in early October, the game camera recorded a steady parade of bucks — one spike, a very tall six-pointer, several eights, a nine and a 10 (that showed up only once, during the rut), and a 14-pointer that came again, and again, and again — always in the middle of the night. Until Nov. 8, right at the peak of the rut. I’d dilly-dallied that morning but decided shortly after sunrise to go down and sit for a while, hoping that a rut-crazed buck might visit during the day, never dreaming it would be the one I really wanted. And here’s where the rain really mattered. It had rained a little a day or two before, and the wet ground and leaves allowed me to approach silently using the tall weeds for cover, and as I neared my stand an open place in the brush allowed me to see the buck eating corn 30 yards away. I froze. He raised his head and looked in my direction, then resumed feeding. As soon as he put his head down, I raised the gun and fired. Buck down. My buck of a lifetime was a main-frame 10 with four nontypical points. The left side had five main points with a 4-inch sticker off the G-2 antler and a broken-off sticker on the G-3. The right side had five main points with a twisty 3-inch sticker off the right base and a broken-off sticker on the G-3. He had only a 14.5-inch spread and not a lot of mass, so he had only 127 inches of antler total. But what his rack lacked in size it made up for in character. If he had not broken off two sticker points by early October it would have looked even better. Undoubtedly, rain played a part in producing this buck. The biologist who scored him and I both estimated him at 3.5 years of age based on his youthful body shape. That means he was born in the spring of 2013. That year had consistently good rains from January through July, when fawns were developing, being born and nursing. So he got off to a good start. Then came 2015, when record rains fell during spring and fall, followed by 2016, when very heavy rains fell during the spring. I’m already looking forward to the 2018, 2019 and 2020 hunting seasons. There’s no telling what will show up. The Texas Parks and Wildlife Department has a staff of wildlife biologists who work to assist private landowners with developing management plans designed to meet the landowner’s goals. For many landowners, one of those goals is improving the quality of their deer herd. You can find the biologist for your area, as well as other helpful information, by visiting the Texas Parks and Wildlife website.